After successfully blocking construction of the U.S.-Mexico border wall for seven hours on Wednesday (Dec. 17, 2008), El Paso environmentalist Judy Ackerman was handcuffed and led away from the construction site. You might think that with its upcoming TV show, the Department of Homeland Security (DHS) would retire satisfied from the indoctrination wars. Alas, too much is never enough for tyrants. So signal a victory has not kept one of the DHS’s sub-agencies, the Transportation Security Administration (TSA), from releasing the propaganda it traditionally does at Christmas. And as usual, its lackeys in the press leaped to publish the drivel under such headlines as "Flying tips for the holidays" (Hmmm. Tips of what? ), "Airport Traveling Tips" ("Tip #1: The prudent airport never packs a copy of the Constitution. True, this mere piece of paper doesn’t take up much space, but what good is it? "), and "Help Keep Holiday Travel Hassle Free" (yeah, right). The effort to impose national standards for photo IDs remains a bone of contention between federal and state officials. December 22, 2008 (Computerworld) As President-elect Barack Obama prepares to take office, it's unclear how his administration will proceed on the technology-heavy Real ID program. But what is all too clear is that the three-year-old effort to impose identification-card standards on state governments remains mired in controversy. Obama has made virtually no public comments about the initiative, which calls for driver's licenses and other state-issued IDs to include digital photos and be readable by scanning devices. In addition, the one time that the Senate considered a Real ID funding issue during Obama's tenure there, he didn't cast a vote. Meanwhile, Arizona Gov. Janet Napolitano, Obama's choice to be secretary of the U.S. Department of Homeland Security, signed a bill in June barring her state from participating in the program. And during a Senate committee hearing last year, she said that complying with the rules would cost state governments a total of $11 billion. The DHS is responsible for implementing the Real ID rules. 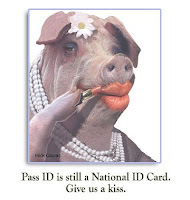 "I don't think anybody in the next administration, including Napolitano, wants to deal with Real ID," said Jim Harper, director of information policy studies at the Cato Institute in Washington. "It's a real stinking mess. Most likely, they'll find the quietest way they can to get it off their plates." The Real ID Act was signed into law by President Bush in 2005 as part of the government's effort to combat terrorism. Other IT-related provisions require participating states to store digital images of IDs for up to 10 years and link their driver's license databases to one another. But the law has been widely criticized by privacy advocates and civil rights groups. Even a DHS advisory committee voiced reservations about Real ID last year, citing privacy, security and logistical concerns. Real ID has also become a bone of contention between the DHS and state governments that see it as an attempt to force unwanted standards down their throats while making them pay for the program. In addition to Arizona, states that have said they won't participate include Arkansas, Idaho, Maine, Montana, New Hampshire, South Carolina and Washington. 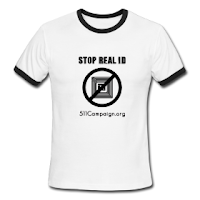 There's no mandate that states issue Real ID cards. But eventually, all citizens will need IDs that comply with the requirements in order to board planes, enter federal buildings and receive federal benefits. The outpouring of protests has prompted the DHS to ease up on its implementation deadlines. For instance, under the final rules set by the agency last January, existing driver's licenses will continue to be accepted as federal identification until December 2014. And people who are age 50 or above at that time won't have to show Real ID cards for another three years. Also, after initially setting a deadline of last March for states to request extensions on meeting an initial set of Real ID requirements, the DHS backed off of threats to begin enforcing the rules. Harper said the agency decided to slow down and pass the baton to the next administration. DHS officials "realized there's just no way they're going to win this" by taking a confrontational approach, he said. At this point, the only reasonable way forward is for the DHS to work more cooperatively with states on Real ID implementations instead of continuing to "dangle sabers over their heads," said Chris Dixon, an analyst at Input, a government IT consulting firm in Reston, Va.
"This should have been put to bed long ago," Dixon said, noting that many states are already implementing new ID features similar to what Real ID requires, as part of their own efforts to improve security. If Napolitano is confirmed as head of the DHS, said Dixon, her experience as the governor of a state that is fighting Real ID might help point the way to a resolution. "Napolitano," he said, "could sit down with the governors and try to find a way out of this impasse."